The NVM wants everybody to be able to make Videogames! Through our learning programmes we aim to encourage and enable engagement with videogames in lots of different environments. Schools, clubs, family-learning, corporate training - there’s a place for everyone in our learning. We are proud to have welcomed thousands of students from all around the country giving them the chance to play loads of interactive exhibitions that celebrate and challenge videogame culture. We want to inspire new people, to make new games about new kinds of subjects! Make your next school trip a fun one! 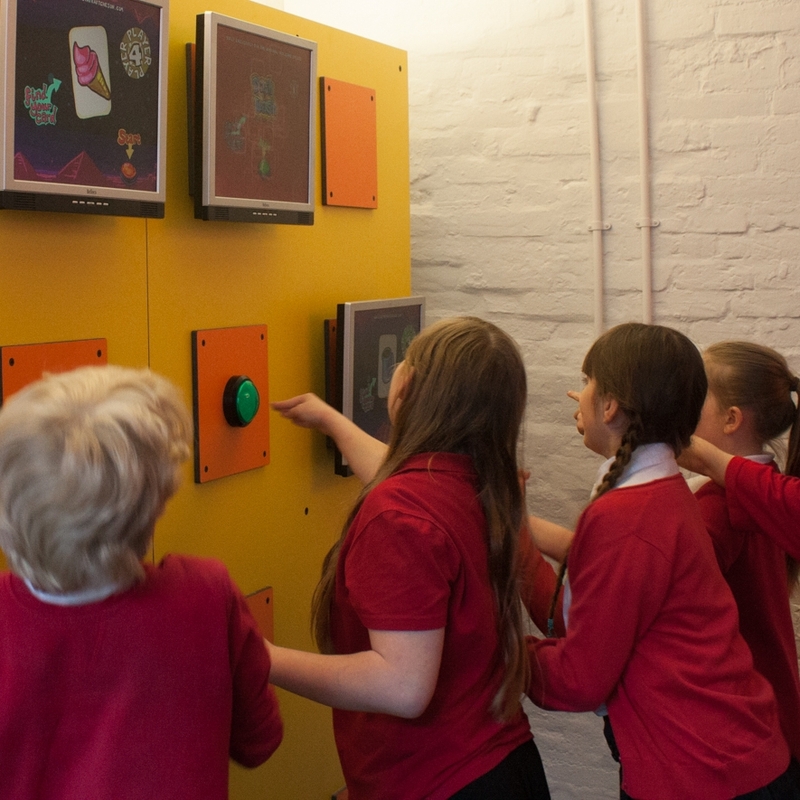 The NVM consists of interactive exhibitions that are both fun and educational! We’re about to relaunch a new curriculum pack, helping you best relate your visit to key-stage curriculum areas at your school. Sign-up to our mailing list below to find out when these are launched. Visits are scheduled in 2 hour slots. A staff member will be on hand to guide you and answer any questions, and it is up to you to decide how to structure your time in the galleries. We welcome visits from all kinds of education groups including SEN, home education, youth groups, universities, and adult learners groups. We’ve put together a Risk Assessment please use this to create your own prior to your visit. The risk assessment will be reviewed annually, or whenever significant changes are made to the building or its contents. The cost is £6 per child, with a minimum 15 children per school group, book your school trip now. Please note Tuesday – Thursday we are open exclusively for education bookings and on Fridays the building is also open to the public. The National Videogame Museum does not have any parking facilities. Coaches can drop off and pick up at the bus stops on Angel Street or the Haymarket. We can provide a room for packed lunches. There are also a variety of eateries in the surrounding area if you wish to allow students to leave the premises for lunch. The National Videogame Museum is fully accessible via a ramp at the main entrance to the building. Is it suitable for SEN visitors? We always advise SEN educators to visit us prior to booking your visit to assess whether the galleries are suitable for your students. The galleries can be unsuitable for light or noise sensitive guests. Parts of the building where the NVM is housed are open and accessible to the public at all times. We expect all visitors to adhere to our Anti Harassment Policy. There is a gift shop, but we do not build a shop visit into our sessions. Your students are welcome to visit the gift shop at your discretion. We can accept payment via BACS, card, cheque, or cash. Cancellations between 8 and 21 days will be charged 50% of the total booking cost. Cancellations of 7 days or less will be charged 100%. Keep up to date with our education programme, get invites and news.